This paper argues for the projection of DP for indefinites initiated with yi ‘one’ and indefinites initiated with a classifier in Mandarin Chinese. First, a null numeral for ‘one’ is identified. Second, in yi-initial nominals, an indefinite article is also identified. Third, for classifier-initial indefinites, which have no overt numeral, a head movement of a classifier to D is argued for. Therefore, the head of DP in the language can be realized by either an indefinite article or a raised classifier. No argument is in the structure of a bare Classifier Phrase in the language. The paper supports the idea that numeralless classifier nominals exist because of the availability of null numerals. 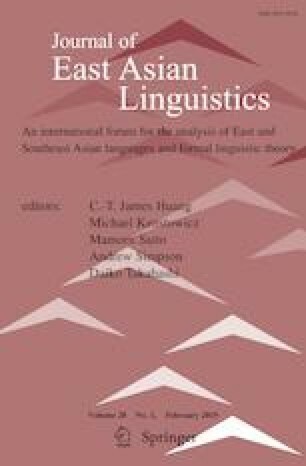 It also proposes a semantic LF reanalysis approach to the dependency of a classifier-initial nominal on a higher head element in the language. I would like to thank Byeong Yi, Junghsing Chang, Jane Tsay, and Sze-wing Tang for data help, David Basilico and Paul Law for discussion of various issues, the audience of the FOSS conference (Kaohsiung, April 27–28, 2018) for their feedback, and James Myers for checking my English. The comments made by three anonymous reviewers and the editors have led to significant improvements. Errors remain mine. Dryer, Matthew S. 2013. “Indefinite Articles.” In: Dryer, Matthew S. & Haspelmath, Martin (ed. ), The World Atlas of Language Structures Online. Leipzig: Max Planck Institute for Evolutionary Anthropology. Available online at http://wals.info/chapter/38. Accessed on 27 Nov 2017.